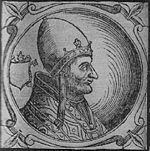 Pope Adrian IV (c. 1100– September 1, 1159), born Nicholas Breakspear or Breakspeare, was Pope from 1154 to 1159. It is generally believed that he was born at Abbots Langley in Hertfordshire and received his early education at the Abbey School, (Saint Albans School). He is the only Englishman to become Pope (although if Pope Joan existed, not the first English person). One of his first acts was to crush a rebellion in Rome that attempted to establish a type of commune, whose leader challanged the pope's temporal authority, believing that the pope should relinquish all such claims. Adrian, however, strngly defended the temporal supremacy of the papacy and crowned Frederick Barbarossa as Emperor. The bull, Laudabiliter, which ceded Ireland to Henry II of England is attributed to him, although this "may have been a forgery." Despite a break-down in his relationship with the Emperor, Adrian IV is considered to have been a competent steward of the papal throne, whose prudent leadership helped to maintain the prestige of the office. Born as Nicholas Breakspeare, the future Pope Adrian IV's father was Robert, a priest of the diocese of Bath, who became a monk at Saint Albans. Nicholas himself, however, was refused admission to the monastery, being told by the abbot to 'wait to go on with his schooling so that he might be considered more suitable' (Abbey chronicles). In the event he did not wait and went instead to Paris and finally became a canon regular of the cloister of Saint Rufus near Arles. He rose to be prior and in 1137 was unanimously elected abbot. His reforming zeal as abbot resulted in complaints against him at Rome. These merely attracted the favourable attention of Pope Eugene III (1145–1153), who created him cardinal bishop of Albano. From 1152 to 1154 Nicholas was in Scandinavia as papal legate, organizing the affairs of the new Norwegian archbishopric of Trondheim, and making arrangements which resulted in the recognition of Gamla Uppsala (later moved to Uppsala) as seat of the Swedish metropolitan in 1164. As a compensation for loss of this territory, the Danish archbishop of Lund was made legate and perpetual vicar with the title of primate of Denmark and Sweden. On his return Nicholas was received with great honor by Pope Anastasius IV (1153–1154). When Anastasius died, death of the latter was elected pope on December 5, 1154. He took the name Adrian IV. His first challenge was to discipline Arnold of Brescia, the leader of the anti-papal faction in Rome. Arnold's followers had taken control of the city and established a Republic. They repudiated ownership of property, and despised the wealth and power of the Church. Arnold believed that the pope should lead spiritually and relinquish temploral claims. Disorder within the city led to the murder of a cardinal, causing Adrian IV, shortly before Palm Sunday 1155, to take the previously unheard-of step of putting Rome under interdict, suspending all worship and closing the churches down. The Senate responded by exiling Arnold. In 1155, Byzantine Emperor Manuel Comnenus invaded Italy from the south, landing his forces in the region of Apulia. Making contact with local rebels who were hostile to the Sicilian crown, Byzantine forces quickly overran the coast lands and began striking inland. Pope Adrian IV watched these developments with some satisfaction. The Papacy was never on good terms with the Normans of Sicily, except when under duress by the threat of direct military action. Having the "civilized" Eastern Roman Empire on its southern border was infinitely preferable to Adrian than having to constantly deal with the troublesome Normans. Therefore, negotiations were hurriedly carried out, and an alliance was formed between Adrian and Manuel. Adrian undertook to raise a body of mercenary troops from Campania. Meanwhile, Manuel dreamed of restoration of the Roman Empire; this was, however, at the cost of a potential union between the Orthodox and the Catholic Church. Negotiations for union of the eastern and western churches, which had been in a state of schism since 1054, soon got underway. The combined Papal-Byzantine forces joined with the rebels against the Normans in Southern Italy, achieving a string of rapid successes as a number of cities yielded either to the threat of force or to the lure of gold. The future looked bleak for the Sicilians. It was at this point, just as the war seemed decided in the allies' favor, that things started to go wrong. The Byzantine commander Michael Palaeologus alienated some of his allies by his arrogance, and this stalled the campaign as rebel Count Robert of Loritello refused to speak to him. Although the two were reconciled, the campaign lost some of its momentum. Yet worse was to come: Michael was soon recalled to Constantinople. Although his arrogance had slowed the campaign, he was a brilliant general in the field, and his loss was a major blow to the allied campaign. The turning point was the Battle for Brindisi, where the Sicilians launched a major counter attack by both land and sea. At the approach of the enemy, the mercenaries that were serving in the allied armies demanded impossible rises in their pay. When this was refused, they deserted. Even the local barons started to melt away, and soon Adrian's Byzantine allies were left hopelessly outnumbered. The naval battle was decided in the Sicilians' favor, and the Byzantine commander was captured. The defeat at Brindisi put an end to the restored Byzantine reign in Italy, and by 1158 the Byzantine army had left Italy. Hopes for a lasting alliance with the Byzantine Empire was meeting some insuperable problems. Pope Adrian IV's conditions for a union between the eastern and western church included recognition of his religious authority over all Christians everywhere, and the Emperor's recognition of his secular authority. Neither East nor West could accept such conditions. Adrian's secular powers were too valuable to be surrendered; Manuel's subjects could never have accepted the authority of the distant Pope in Rome. In spite of his friendliness towards the Roman church, Adrian never felt able to honor Manuel with the title of "Augustus." Ultimately, a deal proved elusive, and the two churches have remained divided ever since. Adrian IV is said to have issued a papal bull, Laudabiliter, granting dominion over Ireland to the English monarch, Henry II. The bull made Ireland a feudal possession of the King of England under the nominal overlordship of the papacy. The title the English king was to hold over Ireland was "Lord of Ireland". The theory of western Christendom was that certain states were recognized and others were not; Laudabiliter formally brought Ireland as a political entity into the European polity. Ireland at that time practiced a type of Christianity known as "Celtic." Knowledge of Celtic Christianity is mainly derived from what its critics said, and reconstructions tend to tell us more about the scholar than the reality of Christianity in early medieval Ireland. Celtic Christianity, however, appears to have had several features: a reverence or love of nature as a reminder of God's gifts and glory; use of poetry and of song praising nature; places of natural beauty were considered sacred and many became pilgrimage sites. Monasteries rather than dioceses (the areas over which a bishop exercises authority, usually based on Roman administrative zones) formed the backbone of Celtic Christianity. Monasteries often consisted of a whole village, in which the chief, his subjects, some married with families, others celibate, lived together with the Abbot as spiritual mentor. Abbots rather than bishops exercised authority. Chiefs appear to have been elected, as were the Abbots. Women were respected. Some may have exercised authority equal to that of men. People tend to read back into Celtic Christianity everything they wish to see in contemporary Christianity, so it is not always easy to establish facts. There is debate about whether some women were ordained as priests, and consecrated the Mass. Monks shaved their tonsure from ear to ear, not the crown. Easter was celebrated on the Vernal Equinox. Bishops, it is said, fulfilled mainly ceremonial or liturgical roles. Some priests may have married. It is often claimed that Celtic Christianity was less dogmatic, more concerned with experience. Saint Patrick forbade anyone from persecuting witches. Beautiful calligraphy was used to illustrate Bibles, and learning was encouraged. Several features of the above - the role of women, married priests, doctrinal freedom (or laxity) displeased Rome, hence the bull to allow Henry to bring the Irish Church under Roman jurisdiction. Henry II did not act on the bull until about 1170. At that time various English, Norman, and Welsh aristocrats had begun invading Ireland (c. 1166) because the deposed King of Leinster, Dermot MacMurrough, had asked them to help him regain his throne from his enemy High King of Ireland and King of Connacht Rory O'Connor. Henry was afraid these invaders would turn Ireland into a rival Norman state so he invaded Ireland himself in 1171, using the papal bull to claim sovereignty over the island, and forced the Anglo-Norman warlords and most of the Gaelic Irish kings to accept him as their overlord. Finally the Irish High King accepted Henry's overlordship in 1174 at the Treaty of Windsor. In 1317 some Gaelic kings allied to Edward Bruce signed a document that asked the Pope to withdraw the effect of Laudabiliter. But the main effect from 1172 was financial, as much as political; the tithes, a form of Papal taxation, were applied to Ireland for the first time. To pay its way, Ireland started to use the feudal system. In this regard, Laudabiliter was similar to Adrian's work in Norway, bringing Christians at the edge of Europe into conformity with Rome, in terms of doctrine and taxation. The Irish church had been self-governing for centuries and had never paid its dues to Rome. But in Ireland since 1500 it has come to represent the start of Norman and English rule. Ireland was a feudal territory of the English monarch under the nominal overlordship of the papacy until 1541, when it became a kingdom belonging solely to the King of England. At the diet of Besançon in October 1157, the legates presented to Barbarossa a letter from Adrian IV which alluded to the beneficia or "benefits" conferred upon the Emperor, and the German chancellor translated this beneficia in the feudal sense of the presentation of property from a lord to a vassal (benefice). Barbarossa was infuriated by the suggestion that he was dependent on the Pope, and in the storm which ensued the legates were glad to escape with their lives, and the incident at length closed with a letter from the Pope, declaring that by beneficium he meant merely bonum factum or "a good deed," the coronation. The breach subsequently became wider, and Adrian IV was about to excommunicate the Emperor when he died at Anagni on September 1, 1159. On the other hand, Adrian IV's claim was consistent with official papal theory from at least the time of his namesake, Adrian I. In about 30 years after Adrian's death, this policy reached its zenith during the pontificate of Innocent III, of whom Chadwick writes: "the most powerful of popes politically, he deposed Emperor Otto IV, excommunicated King John of England and made Philip Augustus of France (nominally) take back the wife he had put away." Adrian IV's reign, like that of so many other popes, was set in the context of the Church's struggle for political as well as spiritual authority. Adrian IV is remembered as a competent Pope who generally had his finger on the political pulse, whose stewardship of the throne of Saint Peter retained the respect and support of the princes without which no pope could function. His quick response to the collapse of order in Rome during the anti-papal insurrection testifies to his acumen. The papacy had only a small military militia, more of a bodyguard, to call upon. However, the threat of excommunication was a powerful tool. It was this tool that he used, via his inderdict, to pressurize the Senate to act against the rebel leader. The papal claim to be the dispenser of temporal authority even to such a powerful Emperor as Frederick rested on any ruler's need for Church approval. Belief that if this was withdrawn, their souls faced eternal peril, made up for the Pope's lack of any military capability. Adrian's vision was of a Christian society, in which all aspects of life were subject to the authority of the Church. At its best, this placed spirituality at the center. However, the rebels in Rome and similar rebels elsewhere at that time argues that the Church was too rich, and that this did not reflect the life or the ethic of Jesus of Nazareth. Francis of Assisi would offer a similar challenge to the lifestyle of the leaders of the church, although the Church succeeded in keeping him within its ranks. The counter argument, represented by Adrian, was that he represented not Jesus but the Christ, and the latter is exalted as Lord of Lords and King of Kings. Also, in order to serve and not to be served, the Church needed resources to meet the needs of the needy. ↑ Lavinia Cohn-Sherbok, Who's Who in Christianity (London: Routledge, 1998), 119. ↑ Owen Chadwick, A History of Christianity (New York: Barnes and Noble, 2005), 289. This page was last modified on 20 August 2018, at 21:32.